Click here for GPS eXchange format file. Click here for a map of the approach roads. This will be a whirlwind affair, getting out of Seattle early on Thursday, hike to Twin Lakes or Lake Lillian (at Snoqualmie pass), see the sights, camp over night, and be back in time to get Joan to work at 1PM. Somehow our 6AM rise time doesn't happen but after a little more packing, shopping, and driving we're at the trail at the crack-o-noon! Oh well. A sign in the parking lot (3530 feet) tells you that the "trailhead" is 100 yards farther up the road but in reality this is just a fork in the logging road. Go left and immediately pass a gate and some old headless sign posts. Continue to follow this "trail" (read hot, dusty, rocky, logging road) for a bit over half a mile (and 500 feet up) where you'll see a real trail at elevation 4000 fork off to the left marked by an old tin sign. We follow the trail up up up through a large, old clearcut... not much for picturesque here either but at least it's a trail. Hike up 750 feet in about 3/4 of a mile. About half way up the trail crosses another old road and people have lined the pathway carefully with stones. Wouldn't want to get off-route here ;-) For your effort you are finally rewarded with shade (! ), a beautiful forest, old Doug firs, and a nice path winding through loads of huckleberry bushes. There are views here too, back toward I-90: Silver Peak, Tinkham, Abiel, and the freeway corridor. minutes exploring and chasing frogs and snakes and tad poles. We retrieve our packs and continue on the fork to Lake Lillian. Here the trail traverses with little elevation change under the west flanks of the Mount Margaret summits. Several faint trails fork off to the right - I'm pretty sure they join a ridge path that links the 3 main high points of the mountain. After about a mile you come to a spot where you can see into the "cirque" that contains Twin Lakes. A faint, hard to follow trail forks back (southeast) from here and gains about 400 feet to the real summit of the mountain (5580). We opt to head for Twin Lakes, losing 450 feet in a bit over half a mile, arriving at about 5:30. Here you can continue another .7 miles to Lake Lillian - the trail is rolling and very pleasant for most of that, then climbing steeply 300 feet to the lake. If you go this way, you'll come to an unmarked fork. 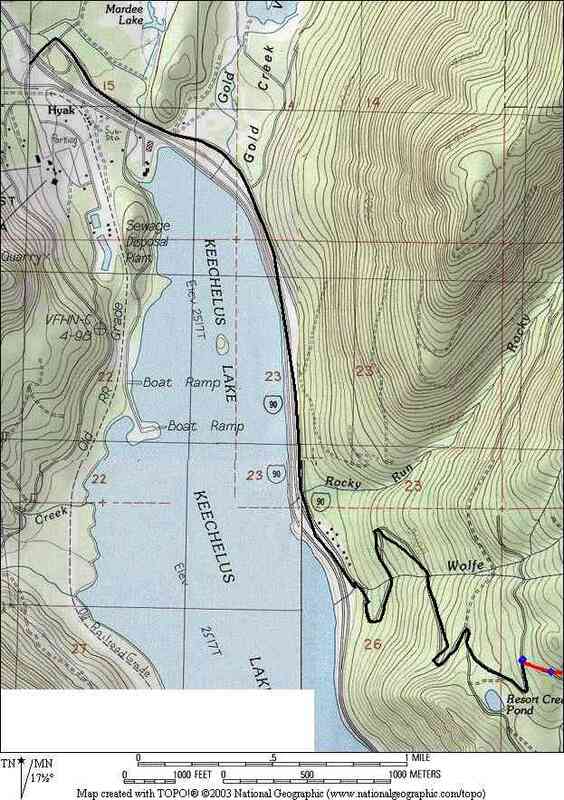 Go uphill (right) to Lake Lillian and downhill (left) to Lake Laura. Given the time, we decide to stay here for the night. Time in: 5.5 hours with stops and excursions. Twin Lakes is in its own little valley, cut off from the rest of the world. It is joined here and there by a half dozen small ponds (mostly dry at this time of year) and surrounded by grassy meadow, more old forest, cliffs and talus. It's a beautiful place and we have it all to ourselves. We drop our gear at the perfect camping spot on the northwest corner of the lake thinking we should explore a little. Joan and Liz end up sitting in the sunshine half way up the talus field to the east, talking girl talk. I continue up the talus, through the forest above and eventually reach the rocky ridge. Huge gendarmes guard the north where the ridge eventually joins Rampart ridge. To the south it winds like a dragon tail amidst rocks and forest to become the high points of Mount Margaret. I follow the ridgeline south for a ways before finally picking my way down the steep hillside back to the lake. The downside of this paradise is the mosquitoes. They are pretty awful. I build a smoky fire and that helps tremendously. Joan cooks. Lizzie struggles with her puzzle of a bivy tent. We dine on gourmet Ramen, red wine with desert of hot chocolate plus John Daniels. We plan Lizzie's birthday party for this weekend. She turns 21 tomorrow ! 08/18/06 fri - Up at 6:30 AM, we make another fire to combat the mosquitoes, breakfast, break camp, pack and begin our return hike at about 9. Back, the way we came in, the trail is steep but short to the flanks of Mt Margaret. While the girls go on ahead I drop my pack and take a quick detour to explore what I hope is a summit trail. It is pretty overgrown and sometimes hard to follow until it finally peters out all together. It's pretty obvious that the top isn't far above me and the forest is pretty clear so I simply head straight up eventually re-finding the trail in the brush just below the summit. It's a beautiful day. I see the familiar view of the I-90 mountains but the ones to the north and east are way less familiar to me except for Mt Stuart way in the distance. The top also looks down on Margaret Lake (with campers) and several other lakes nearby. A very small path leads away to both the north and the south making me wonder if it would be possible to hike the entire ridge starting south of Margaret all the way to Rampart. That would be cool. I head down, losing the trail again. I give up trying to find it, continue straight down and shortly rejoin the Lake Lillian trail. I double back to pick up my pack and then beat feet to catch up with the girls. It's pretty much all downhill from here on out and I make good time, finally catching them near the bottom. Time out: 2 hours including the 35 minute detour to the summit. Remember grasshopper, "the path IS the goal".